These two WiFi enabled offerings from both Philips and Olympus will allow users to dictate and send there files back to their administration without the need to connect to a PC. both the Olympus DS-9500 and the Philips SpeechAir offer full security of data with 256 Bit AES Encryption. Once the audio arrives at its destination the file can be quickly converted to text using Speech Recognition or manually transferred to text through the use of a transcription kit. 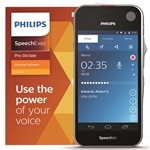 The latest Software from Philips integrates Dragon Speech Recognition for one simple install and cost effective setup. The New Olympus ODMS R7 Software will also allow for integration with separately installed Dragon Software.